This week over at PopMatters, I wrote about Journey's role in inspiring some inspiring thoughts about online communication. Like pretty much everyone else who played it, I was pretty impressed by Journey. Beautiful, triumphant, masterful; I agree with it all. For me, the challenge is honing those emotional impressions into lessons I can learn from. I decided to take a closer look at why I felt so optimistic after playing the game. A big reason was because I felt like all the people I met were having a similarly upbeat experience. Think about that for a second: random, public multiplayer interactions as positive experiences? That's a rare thing. So how did thatgamecompany pull this off? I argue they did it by distilling communication and then letting me unwittingly fill in the gaps with my biases. Without voices, character customization, or mechanically-detrimental multiplayer actions, it's nearly impossible to act like a jerk towards another player. When you can't yell at or hamper another player, the worst you can really do is ignore them, a decidedly neutral action. In the vacuum of explicit communication, I was free to project my predispositions on others. Since I wanted to believe everyone was having a good time, experimenting with the game, and generally being polite, that's all I saw. The limited nature of the communication made me feel closer to my multiplayer friends. There's actually a somewhat disturbing implication here: is Journey just a big confirmation bias experiment? Was I really connecting with those other people, or was I projecting only what I wanted to see and then agreeing with the things I wanted to believe while ignoring any other behaviors. If the key to making a pleasant random multiplayer experience is limiting expression, are we really ever going to get to know other people. Sometimes, communication is simply ugly. These are all questions for another day. For now, I just want to enjoy the opportunity to see the best in my fellow gamer. The confirmation bias perspective is interesting but I don't think it's quite accurate. A lot of other games encourage negative communication because a lot of other games are essentially negative experiences. Your objective in, say, Call of Duty is to kill the most people or score the most points or whatever. That might be fun - I enjoy competitive games a lot - but it's still a game where your objective is to destroy somebody else. And so you're going to feel angry or frustrated more often. I don't think Journey limits expression any more than Call of Duty does. Any game only lets you express yourself within the narrow parameters of gameplay. There are, I think, genuine moments of kindness in Journey. When I played through, my partner appeared to disconnect or log off. I waited around a bit then moved ahead, and a little while later I saw the flashing light that appears when your partner presses the sing button. So I turned around and went back. And then my partner managed to communicate that I had overlooked one of the light orbs earlier in the level, and led me back to get it. I don't think that's confirmation bias. I think it's an attitude in games we just don't see often enough. I hope you're right! The fundamental mindset of most games is adversarial, and the mechanics make it so. Just the other night I met one of the white-robed figures who had clearly played the game more than I had. She/he then proceded to kind of tag along and offer hints when it became clear I was looking for the powerups I had missed. It was thrilling: this person was just hanging around in the game to act as a guide! That moment when you're skating together horizontally across the screen silhouetted by the setting sun... utterly beautiful. Last time I played it, as we slid down the last little incline before it, I was chirping madly trying to convey OH OH OH THIS BIT THIS BIT IS AWESOME. And then you end up below in the dark after that amazing ride straight down, and we just paused and chirped once each. Yes. That whole surfing sequence is one of the best things I've experienced in any medium. What a triumph. I hadn't heard about Ueda's comments, but It's no surprise he liked Journey. So much of that game has been influenced by Ico and Shadow of the Colossus, so I guess it's not surprising. I wonder if it's too late to put some latent multiplayer aspects into The Last Guardian...? my 4 year old son loves journey, my 6 year old prefers 'bloons tower defense 4'. 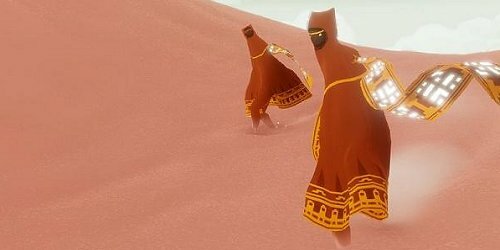 they call journey the sand game. how would you know that the other player is a 4 year old?